I invite you to apply for the 2018-2019 CWE Awards and Scholarships. In addition to the practical financial benefit, an award or scholarship strengthens your résumé considerably for potential employers and graduate school. This booklet describes this year’s awards, submission criteria, and application guidelines. This year, you will be able to apply online, using our new application system (see next page for more information). Please note the March 8, 2019 closing date. Students who are in good standing can apply. DACA, refugee, undocumented and F1 Student Visa students can apply. Many awards are open to students who finish in Fall 2018 and those graduating in Summer 2019. Sophia Demetriou, CWE’s Student Affairs Executive Director, will be holding Information Sessions in Fall 2018 and Spring 2019. You can also contact her with questions: sdemetriou@ccny.cuny.edu. 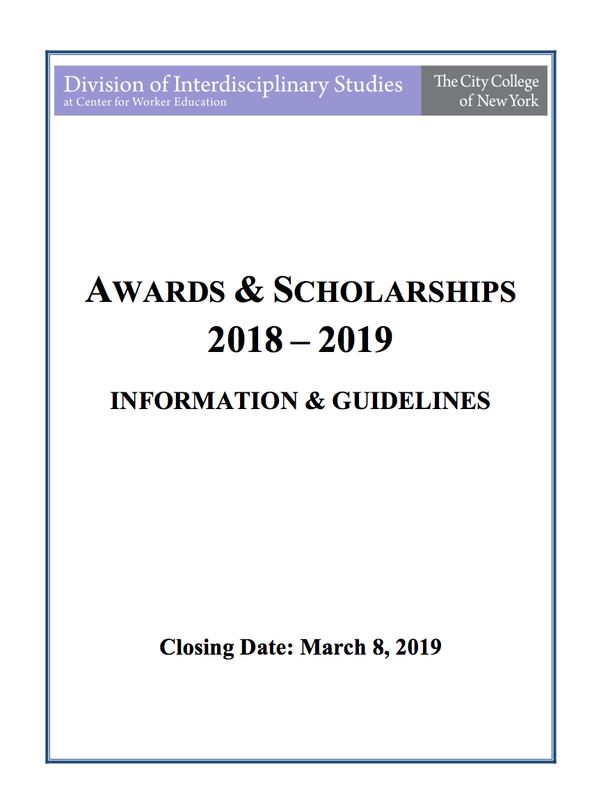 Should you have any queries for the Awards and Scholarship Committee, you can send them to cweawards@ccny.cuny.edu. I look forward to celebrating your accomplishments at our Awards Ceremony in May 2019! Booklets available at the front desk.